Cecil B. De Mille (1881-1959), Motion Picture Director and Producer. In 1913 he joined Jesse L. Lasky and Samuel Goldwyn in forming the Jesse L. Lasky Feature Play Company to produce motion pictures in Hollywood. His first film The Squaw Man was the first full-length feature made in Hollywood. It contributed to the establishment of film as a serious narrative and dramatic medium. He made several innovations in his early works; perhaps the most consequential was the practice of publicizing the leading players. With The Ten Commandments, 1923, he began a series of movies produced on lavish scale and in the spectacular style that was to become his trademark. He later made several movies under his own DeMille Pictures, Metro-Golwyn-Mayer, and in 1932 moved to Paramount. In all, he produced more than 70 films. 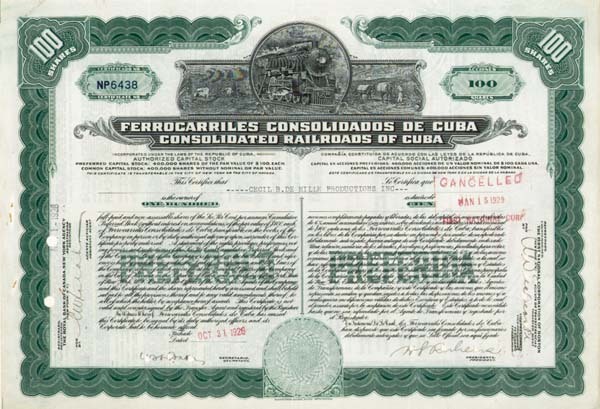 This 1928 100 Shares Stock is made out to CECIL B. DE MILLE PRODUCTIONS, INC. and is nicely signed by De Mille as President as well as others. Couple of minor flaws at margin otherwise Attractive. Excellent Condition. Extremely Rare! Only 1 available.